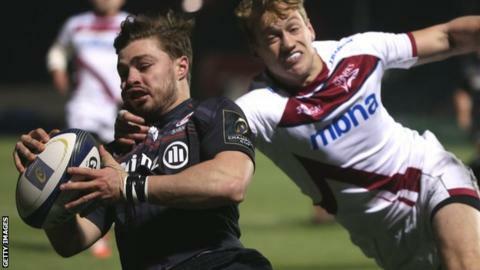 Saracens kept their European Champions Cup hopes alive as they eventually put away a battling Sale side in Pool One. Last year's beaten finalists went 6-0 up through two Owen Farrell penalties but it was Sale who scored the first try as Nathan Hines stretched over. Saracens hit back via Alex Goode but a Nick Macleod penalty made it 11-8. The hosts edged away through a Farrell penalty and superb late tries from Ben Ransom and Billy Vunipola sealed it, despite Eifion Lewis-Roberts's reply. With Munster still to come at home followed by a trip to Clermont Auvergne on the final weekend, Saracens remain right in the mix for a quarter-final berth. But they will rue their failure to secure a four-try bonus point, and none more so than winger David Strettle. The former England man - later to go off after taking a blow to the head - dropped a pass five metres from the line with no defenders near him early in the game, and his uncharacteristic error could come back to haunt him come the final reckoning in what is a very tight pool. Farrell's unerring boot ensured the hosts still took the lead but Sale hit back as towering second row Hines marked his return from injury by reaching over a ruck to score an unconverted try. Saracens finally scored their first try four minutes before the break as the Vunipola brothers, Mako and Billy, combined to force a turnover and Goode went over in the corner. A penalty from fly-half Macleod - with Sale out of contention they had decided to rest first-choice number 10 Danny Cipriani - meant the deficit was only three at the interval. But Sharks never looked like winning and, after Farrell landed his third penalty for the hosts, Saracens eventually pulled clear with two dazzling tries. A Chris Ashton counter-attack and superb break from Billy Vunipola, looking lively after a run of indifferent form this season, ended with Strettle's replacement Ransom racing over in the corner. The second score was even better, a multi-phase handling effort which involved most of the team and went the length of the pitch before Billy Vunipola got the try his display deserved as he powered over with two defenders hanging off him. The sizeable Lewis-Roberts ensured Sale at least had the last word, but even before the match they were focused on the Premiership, whereas Saracens live to fight on two fronts heading into 2015. "We might live to regret not getting the bonus point, but what you want is to be in control going into rounds five and six. "We've Munster coming here and it's going to be a titanic match. "But to have 13 points at this stage is OK and if we win both games you win the group and at least it's in our hands." "Last week we were unlucky not to win the game but this week we were beaten fair and square by the better team on the night. "The difference between the squad sizes and quality was shown when the benches changed and that was the turning point. "They've got one or two outstanding carriers who played really well so we've got no complaints." Saracens: Goode; Ashton, Wyles, D Taylor, Strettle; Farrell, Wigglesworth; M Vunipola, George, Du Plessis, Kruis, Hargreaves, Brown, Burger, B Vunipola. Replacements: Hodgson for Wyles (77), Ransom for Strettle (20), De Kock for Wigglesworth (61), Barrington for M Vunipola (68), Sharman for George (77), Johnston for Du Plessis (68), Hamilton for Hargreaves (61), Wray (for Burger, 56). Sale: Haley; Brady, Addison, Jennings, Cueto; MacLeod, Cliff; Harrison, Mamukashvilli, Cobilas, Hines, Ostrikov, Easter, Braid, Beaumont. Replacements: Ford for Macleod (51), Fowles for Cliff (70), Flynn for Harrison (78), Neild for Mamukashvilli (72), Lewis-Roberts for Cobilas (66), Mills for Hines (66), Hughes for Braid (60).